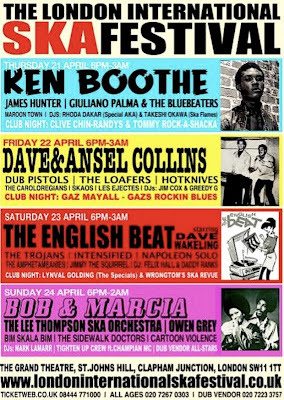 The London International Ska Festival starts tomorrow, Thursday 21st April, lasting until Sunday and featuring an array of Ska and Reggae acts from around the world. 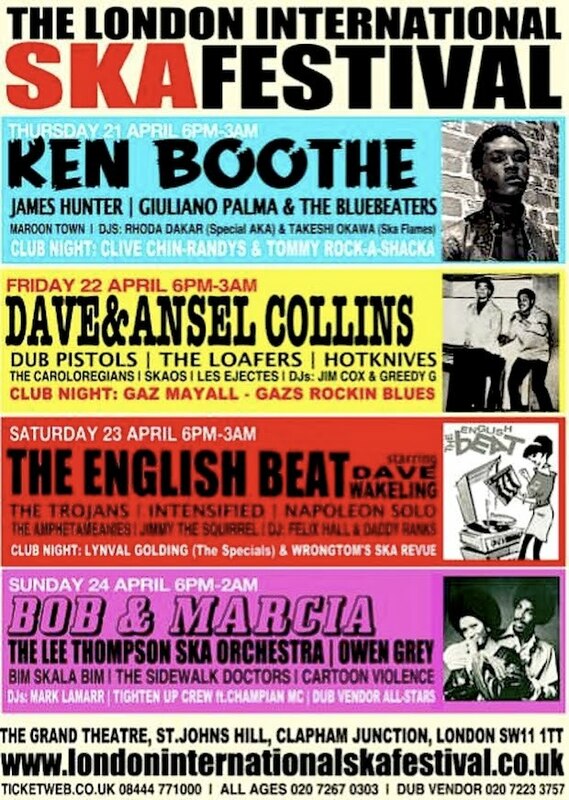 Headline acts include Jamaican legends Ken Boothe, Marcia Griffiths and, reuniting for the first time since the 1970s, Dave & Ansel Collins, who will be celebrating the 40th anniversary of their UK Number One single, 'Double Barrel'. Also performing is foundation singer and Alpha Boys school graduate, Owen Grey - one of the first vocalists to record for Island Records and Coxson Dodd. The festival will be held at the Clapham Grand Theatre, St. Johns Hill, Clapham Junction, London, SW11 1TT and promises 38 bands and DJs from 11 countries showcasing all Ska has to offer: from it's roots in American Rhythm & Blues, to the Jamaican originators, the progression into Rocksteady, Reggae and Two Tone, to the very latest 21st Century Ska sounds. As well as the headliners, top names include James Hunter, Giuliano Palma & The Bluebeaters and DJs Clive Chin (Randy's Records), Mark Lamarr, Gaz Mayall, Jim Cox, Tommy Rock-A-Shacka, Greedy G and many more.